I must be on the ‘send her email last list’ because I just received the notice from Hilton for their Fall promotion. And, on first look, this seems to be quite a bit more lucrative than the Marriott MegaBonus. Hilton is definitely a hotel that I manage to frequent during the year. My husband travels and sometimes the booking falls to me, and Hilton properties make their way into the mix. This promotion looks to be really doable. Hilton is just finishing up with it’s Double Your Honors promotion which began in March and was extended through the end of August. With a stay in Orlando and a stay in Virginia recently, we have just about recouped the points we used for an award stay this year. It is a pretty straightforward proposition: Hilton is offering double points for weekday stays (Monday through Thursday) and triple points for weekend stays (Friday through Sunday). According to the website, upon registration, your account may be eligible for an extra bonus once you begin the promotion. Hilton is making me work for mine – the offer was for an additional 4000 points on my 4th stay with them. All stays must be booked directly through Hilton at ANY hotel in the Hilton Portfolio from September 1st through December 31st, 2015, in order to earn Bonus Points. Conrad Hotels & Resorts, Curio Collection, Waldorf Astoria Hotels & Resorts, Hilton Hotels & Resorts, Embassy Suites, DoubleTree by Hilton, Hilton Grand Vacations, Hilton Garden Inn, Homewood Suites by Hilton, Home2 Suites and Hampton. Be sure to use your Hilton App to plan and book your stay. I covered this in Hilton’s Digital Key – Smartphone Convenience. For the Triple Your Trip promotion, the Bonus Points you earn per night are calculated based on the average nightly cost of your total stay (average nightly cost is calculated by taking the total cost of your stay during the Promotion Period, divided by the total number of nights of the stay). Triple Your Trip “Double Points” are awarded for Monday, Tuesday, Wednesday and Thursday nights in your stay. Triple Your Trip “Triple Points” are awarded for Friday, Saturday and Sunday nights in your stay. *Keep in mind, this does not count the extra 5 points per dollar spend that you earn for choosing Points and Points. Nor does it account for any bonus you may receive from either of the branded credit cards (10 for Citi and 12 for the AMEX). *The offer (“Triple Your Trip”) is valid for eligible stays completed between 1 September and 31 December, 2015 (“Promotion Period”) at any hotel or resort in the Hilton Portfolio. Hilton HHonors members must first register at HHonors.com/Triple prior to check-out of your stay within the Promotion Period. Registered HHonors members will receive the bonus only for nights completed during the Promotion Period, regardless of a check-in date before the Promotion Period begins or a check-out date after the Promotion Period ends. For the Triple Your Trip promotion, the Bonus Points you earn per night are calculated based on the average nightly folio of your total stay (average nightly folio is calculated by taking the total net folio of your stay divided by the total number of nights of the stay). Triple Your Trip Double Points are awarded for Monday, Tuesday, Wednesday and Thursday nights in your stay. For a detailed explanation of how points are issued for Triple Your Trip, please see Frequently Asked Questions. 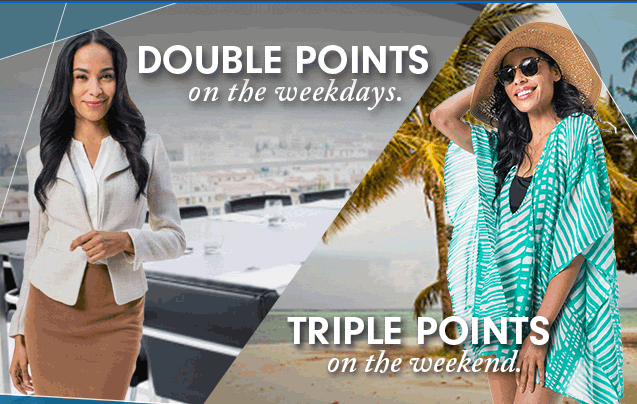 “Double Points” means you will receive a bonus equal to double the number of Base Points earned during a stay. Bonus Points earned on Base Points do not count toward tier qualification. Please allow six to eight weeks from completion of your stay for points to appear in your HHonors account. Offer is not transferable, is not valid for groups and cannot be combined with other select offers. †This offer is valid for select Hilton HHonors members who receive this offer after registering for the (“Triple Your Trip”) promotion. It cannot be combined with other offers and is not transferable. The offer is valid for eligible stays completed between 1 September and 31 December, 2015 (“Promotion Period”) at any hotel in the Hilton Worldwide portfolio. Select HHonors members will receive 4,000 Bonus Points after the completion of their fourth stay within the Promotion Period. Bonus Points earned on Base Points do not count toward tier qualification. Please allow six to eight weeks from completion of your stay for points to appear in your HHonors account. If you are a regular at Hilton Hotels, then I can see this being quite a generous promotion. What kind of bonus did you receive? Be the first to comment on "Triple Your Trip with Hilton’s Fall Promotion"